When you need ultra-fine droplet-sized sprays for evaporative cooling, moisturization, atomization and humidification, Sprayvectors are the answer. Using compressed air, these liquid atomizing devices create micron and sub-micron sized spray droplets for greater surface coverage than conventional nozzles. 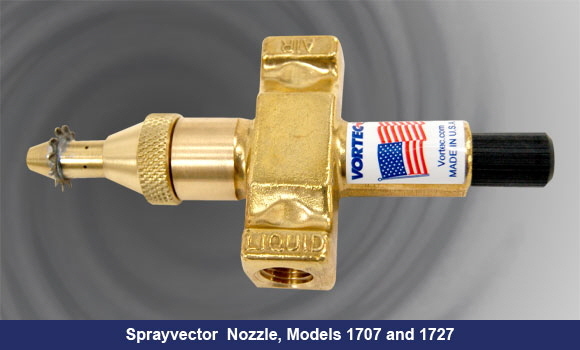 Superior to hydraulic or piezoelectric nozzles, Sprayvectors accelerate air -liquid interaction and produce defined spray patterns that can be widely diffused or highly directed. These unique nozzles introduce low pressure (2-20 PSIG) liquids into large internal passages to eliminate clogging. Three models are available; Atomizing or Fogging styles deliver a dense, directable, high velocity spray for viscosities up to 1100 CPS, while the Humidifying model produces a very diffused, low velocity spray for viscosities up to 100 CPS. All styles feature a control knob for precise, fingertip adjustment of liquid flow rates. Water, chemicals, rust inhibitors, cleaners, solvents, preservatives, insecticides, lubricants and a wide diversity of other fluids can be dispensed. Sprayvectors are compressed air operated liquid atomizing devices capable of producing sub-micron sized spray droplets. Sprayvectors use the airflow amplification principle to produce a defined spray pattern. Spray patterns can be either widely diffused or directed. The spray characteristics are superior to conventional hydraulic nozzles (high pressure liquid forced through a tiny hole), and even exceed those of piezoelectric nozzles. Sprayvectors produce very small droplet size which results in more surface coverage. As droplet size decreases, the total number of droplets increases at a higher rate. The result is that the combined surface area of droplets in the spray is increased exponentially. Increased surface contact provided by Sprayvectors produce: accelerated liquid-air interaction, more effective evaporative cooling, economical use of liquid, controlled, efficient humidification, and effective dust control. Sprayvectors perform effectively because of their unique design. 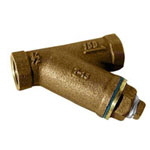 Filtered, low pressure liquid )2 – 20PSIG) is introduced through a 1/4-NPTF port. Large, internal fluid passages virtually eliminate clogging, and permit atomization of liquids up to 1100 CPS. Precise, adjustable liquid flow rates (0 – 30 GPH) are achieved with a knob control. Dry, filtered compressed air, supplied at normal shop pressures ( up to 100PSIG ), permits fluid atomization (from 0.1 to 200 microns), using only 12 SCFM maximum. External mixing of fluids and compressed air permits delivery of a dense, directable, high velocity spray pattern using the Atomizing and Fogging Sprayvectors, or a diffused spray pattern using the Humidifying Sprayvectors. Sprayvectors are available in Fogging models, Atomizing models, or Humidifying models. Fogging and Atomizing models deliver a targeted spray of ultra fine droplets. Fogging models deliver droplets in the 20 – 60 micron particle size range. Fogging Sprayvectors are ideal for moisturizing, evaporative cooling, spray drying, and dust suppression. Atomizing models deliver droplets in the 60 – 200 micron particle range. Atomizing Sprayvectors are ideal for coating, washing, and applying lubrication. Humidifying models deliver a diffused spray of droplets in the 20 – 200 micron particle range. Humidifying sprayvectors are ideal for humidification, mist coating, and moisturizing, evaporative cooling, and spray drying. Arithmetic Median Diameter: the average size of all the droplets in the spray (50% of the droplets are larger, and 50% are smaller than this diameter). This is a good general measure for comparing sprays, and is usually the smallest median diameter numerically. Sauter Mean Diameter: compares the ratio of volume-to-surface area of a single droplet, to the ratio of volume-to-surface area of the entire spray. This droplet diameter comparison permits calculation of the surface area of the spray when the volume is known. Droplet size, calculated by this method, is approximately 70%-80% of the volume median diameter. Volume Median Diameter: is the diameter of a single droplet, whose volume, when multiplied by the total number of droplets in the spray, is found to equal the total spray volume. The volume median diameter is calculated by dividing the total spray volume in half (50% of the total volume will have larger diameter droplets and 50% will have smaller diameter droplets). Calculations using this method give more consideration to the larger droplet sizes. Physical Measurement: droplets may actually be collected in some medium or frozen, then sized and counted. Kinetic Calculation: velocity of inertial differences may be used to size or sort droplet sizes. Direct Photography: photography, video systems, or pulsed-laser holography can ‘freeze” the spray in time, allowing droplets to be sized and counted. Optical Systems: forward light scattering diffraction and imaging methods are used by very sophisticated electronic devices with computer interface, capable of high-speed sampling with real time display and hard copy printout. Sprayvectors were tested using an optical system. 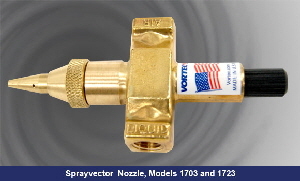 Sprayvectors operate on normal factory compressed air pressure (80-100 PSIG). Because the compressed air is throttled through a narrow annular orifice, it must be filtered to a quality level of at least five microns to prevent clogging. We offer five micron Auto Drain Filter/Separators for this purpose. Where oil is a problem, an oil removal filter should be installed downstream from the filter/separator. Fogging and Atomizing Sprayvectors operate with a wide range of liquid types, with viscosities up to 1100 CPS. Humidifying Sprayvectors are designed for liquids with viscosities lower than 100CP5. We offer Y-type liquid strainers with a 40-mesh (.015) stainless steel screen. The screen is removable for cleaning without breaking the fluid line. Evaporative Cooling requires ultra-fine droplets to facilitate rapid evaporation. Cooling results are a function of the surface area and weight, thermal conductivity, and temperature of the part to be cooled. If the temperature of the part is above 212F, most heat transfer will be due to evaporation. Cooling of parts with temperatures below 212F is due to a combination of heat transfer by convection of the airstream and heat conduction by the cooler liquid. Moisturization of a moving web requires precise liquid control. Sprayvectors deliver ultra-fine droplets and dripless operation (with a universal-type, 3-way solenoid installed in the fluid supply line), over an entire web surface or to specific, independently-controlled zones. Washing and Coating require directed, high-velocity sprays. The Atomizing Sprayvector is especially well suited for spraying viscous materials. It can be controlled with a timed solenoid to give an air-only blowoff cycle, too. Humidifying “free” air or ducted air requires micron-sized droplets. Humidifying Sprayvectors can supply precise, controlled humidity levels, when used with a humidistat for on-off operation. Humidifying Sprayvectors should be installed with the spray discharge centered in the airstream, and with the spray direction parallel to the direction of air movement. The function of a high performance spray is to deliver a controlled amount of suspended liquid to a defined location. Expanded surface area produces a quicker and more efficient liquid/air interaction. If the liquid is a chemical (an insecticide, for instance), this fine-spray, expanded-surface-area produces an efficient, air-delivered fog in controlled concentrations. Other chemicals that rely on oxygen for reaction can have accelerated reaction rates with expanded surface areas. Efficient air humidification is available through small-droplet / large-surface area sprays. Specialized applications, such as dust suppression are only practical with smaller droplets. By producing micron-sized droplets, a Sprayvector maximizes the total available surface area of a given volume of liquid. For example, there are approximately 58,000 droplets of 5000-micron diameter (a heavy mist) in one gallon of water. The combined surface area of these 58,000 droplets is about 49 square feet. However, when the droplet diameter is reduced to one micron, that same gallon of water yields 244,500 square feet of surface area (5.6 acres). Humidifying Sprayvectors produce low-force sprays in a pattern up to 80 inches in diameter. Fogging Sprayvectors produce a forceful 5-inch diameter spray pattern. Atomizing Sprayvectors produce a forceful 5-inch diameter spray pattern. Sprayvector Experimental Kit, includes an air filter, fluid strainer and all three nozzle tips: atomizing, fogging & humidifying – making the sprayer selection process quick & easy.